When I was at school, I had heard that the planets move around the Sun on ellipses (ovals), instead of circles. I really wanted to know why this was the case, but my teachers couldn't give me a satisfying explanation that I could understand. The aim of this tutorial is to show elliptical motion is a consequence of Isaac Newton's inverse-square law of gravitation (see below). 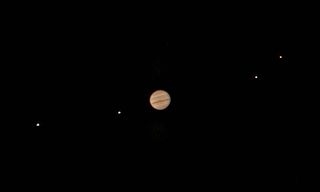 The study of the motion of the planets has generated revolutions in our understanding of our place in the Universe. The first revolution came with the realisation that the Earth moves around the Sun, rather than, as had been supposed by the Greek philosophers Ptolemy and Aristotle, the Sun moving around the Earth which is at the centre of the cosmos. This 'heliocentric' (sun-centred) idea was developed by Copernicus in 1543, but was considered by many to be heretical and incompatible with Christian teachings. In 1632, Galileo cleverly attempted to avoid the censure of the church by presenting his arguments in favour of Copernican theory in the form of a conversation between three friends, in the "Dialogue concerning the two chief world systems". Perhaps unwisely, Galileo named one of his characters Simplicio (or 'simpleton'). Simplicio argued in a simplistic manner in favour of the Earth-centred view, using words very similar to those used by the pope of the day. In 1643, Galileo was found by Inquisitors to be "vehemently suspect of heresy", and he was forced to recant. According to legend, after recanting his theory, Galileo muttered the rebellious phrase "And yet it moves", referring to the Earth's motion around the Sun. Although there is no evidence that he really said this, it is certainly plausible that Galileo never truly changed his mind; after all, Galileo was the first person in human history to see the moons of Jupiter, which must have been a truly profound and formative experience. A philosophical legacy of the Greeks was a prejudice that circles were "perfect" shapes. To account for the wandering motion of the planets across the night sky, Ptolemy had devised an ingenious model based on circular motion. In his model, each planet moved on a small sphere or circle, called an epicycle, that moved on a larger sphere or circle (centred on the Earth), called a deferent. The Ptolemaic model could be made to fit observations of planetary motion well, by (i) tuning the diameter and frequencies of the epicycles, (ii) by moving the Earth away from the centre of the large circle, and (iii) with a trick called the equant. However, by the early 1600s increasingly accurate measurements made with new telescopes were posing a challenge to the model. 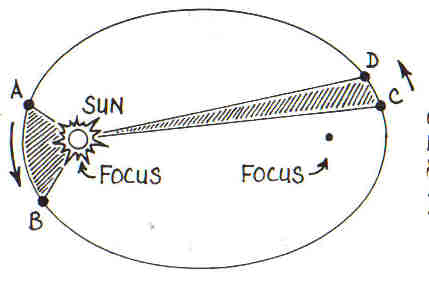 The orbit of every planet is an ellipse with the Sun at one of the two foci (focuses). Kepler deduced his laws from empirical evidence. It took the genius of Isaac Newton to reveal the underlying physical theory. In the third volume of his Principia Mathematica, Isaac Newton showed that his three laws of motion, in combination with his law of universal gravitation, could explain Kepler's laws of planetary motion. Here, "Force" and "acceleration" are directional quantities ("vectors"). Newton's 2nd law tells us that a body is accelerated in the direction of the force. where F is the force between the masses, G is the gravitational constant, m1 and m2 are the masses, and r is the distance between the centres of the masses. where M is the mass of the Earth, and R is its radius. Crucially, the mass of the body experiencing gravity's attraction does not appear in this formula. In the absence of air resistance or other forces, all bodies fall under gravity in the same way. This was shown by Galileo in 1589 in his famous experiment at the Leaning Tower of Pisa. Let's consider the motion of a planet around the Sun.